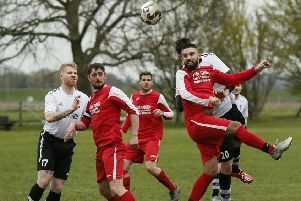 Dunstable Town finished their Southern League Premier DIvision season in disappointment after they were beaten by already relegated Bedworth United at the weekend. Early on, the visitors went close, when Elliott Parrott had an early run and a shot that was well held by keeper Bart Pedrycz. The Blues stopper then had to tip Justin Marsden’s effort over the bar, before Bedworth were ahead on 14 minutes when Jordan Archer finished well. However, Dunstable weren’t behind for long, as two minutes later, Connor Calcutt, showed some good skill and control before picking his spot to give James Martin no chance. The equaliser pepped up Town as Steve Wales’ shot was deflected behind, while Chris Vardy fired over and David Keenleyside tried his luck too. Bedworth responded with a decent shot from Archer that was held by Pedrycz, before, before Dunstable tested Martin again, with the keeper holding Wales’ effort. After the break, Keenleyside and Wharton combined well, with Calcutt’s deft back-headed flick foiled by Martin, before Gary Wharton fired over and Calcutt’s free-kick was saved by the keeper. However, United’s Jonathan Gould then set off on a fine mazy run, beating three defeats to set up Archer who scored from close range after 58 minutes. The Greenbacks’ original lead had lasted two minutes and it seemed that this was going to be repeated when Dunstable appeared to have equalised, as Wharton’s cross was sliced into his own goal by a visiting defender. The linesman’s flag was raised though and the goal was eventually chalked off for what appeared a dubious offside call. However, Town continued to look for a leveller as Keenleyside’s superb overhead kick went narrowly wide, although Archer ought to have made it 3-1 on more than one occasion, missing a succession of glaring chances. With time running out, Zack Reynolds provided the assist for Wales but Martin was equal to his effort as Dunstable finished a creditable first season back at this level in 11th place. At the end of season awards, Supporters Club player of the season went to Zac Reynolds, who also won the Players Player of the Season too. Danny Talbot was Top Goalscorer and Adam Pepara picked up the Manager’s Player of the Season award. Dunstable: Bart Pedrycz, Zac Reynolds, Howard Hall (Jonathan Wyllie 87), Mark Smith, David Longe-King, Adam Pepera, Anthony Leslie (Tony Fontenelle 77), Steve Wales, Connor Calcutt, Chris Vardy (Gary Wharton 35), David Keenleyside. Sub not used: Danny Talbot. Bedworth: James Martin, Daniel Kavanagh, Luke Rowe, captain, Andrew Westwood, Kyle Cartwright, Abdul Mohammed, cautioned, Justin Marsden, Elliott Parrott, Jordan Archer, Nathan McGarrity (Iyseden Christie). Subs not used: Mouhamaboul Fall, Adrian Boitas.